Working in the Northeast and having limited lunch options, we were really excited when we heard about The Blue Duck. Unfortunately, it took us a while to get there, but the wait was well worth it. Even though the place doesn’t look like much from the outside—it’s tucked in the middle of a strip mall and has a pretty plain-Jane unassuming sign—the inside brightens up and is warm and welcoming. There are plenty of tables up front and even some seats at the open kitchen, which is great for people like us who like to watch chefs work. Blue Duck is BYO, which we did not indulge, as we were stopping in for lunch. The food, though, makes up for any lack of alcohol. It’s a little hard to categorize the place, as they are known mostly for their Pork Roll Burger and their Blue Duck Fries, so it’s easy to think of them as only a sandwich shop. Until, that is, you see the entrees—wild boar meatloaf, sweet potato gnocchi, etc. This is the kind of place where you can tell the chef has the chops to work most places, but just loves makes delicious sandwiches. And we have absolutely no problem with that. Blue Duck Fries: We hate to be obvious, but holy crap are these great. 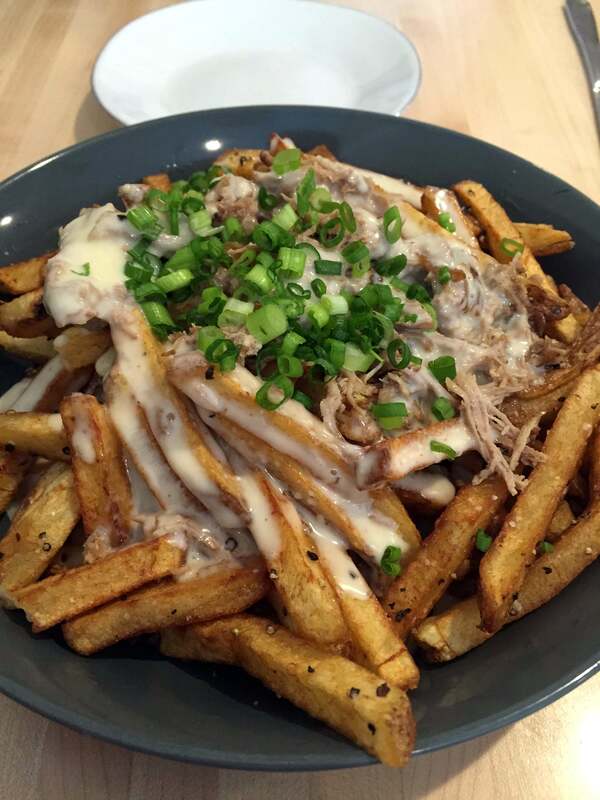 A pile of perfect, crispy fries cooked in duck fat, topped with a generous helping of shredded duck confit, and topped with a smoked gouda cheese sauce, these things are like uber-poutine. Every bite is salty, savory, and satisfying, and you’ll want to finish every last bite—just be sure to have a friend to help if you wanted to order more than just the fries. 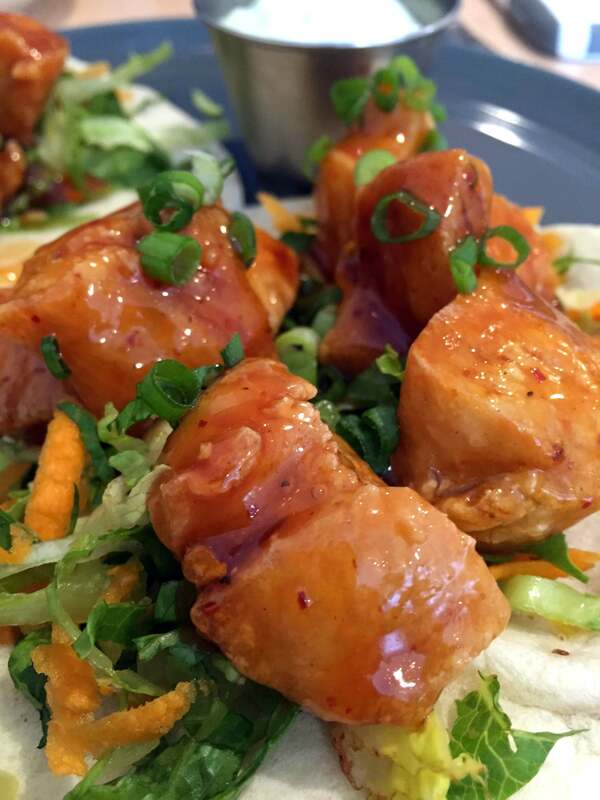 General Tso’s Tacos: You might be a little taken aback by a taco appetizer that costs $10, but if there is only one of you, this could very well be your whole meal. The two tacos comes with a side of wasabi blue cheese dressing, shredded carrots, shredded lettuce, and massive piles of crispy chunks of General Tso’s chicken. So much that it’s an ordeal to keep one together as you eat it, but therein lies the beauty. It doesn’t hurt that the flavor is spot-on, but doesn’t come with all the thick, dripping sauce, so the tacos aren’t as messy as you would think. The Blue Jawn: After the colossal portions of the starters, we were expecting burgers that we’d be hard-pressed to finish, but they are actually a reasonable size. This one has a patty of duck and beef and is topped with Maytag blue cheese, red onion jam, and mesclun on a nice brioche bun. The jam cuts the sharpness of the cheese well, and the only real problem is that the patty feels overcooked, since the presence of the duck prevents it from being held to medium-rare. Otherwise, a spot-on burger. This entry was posted on October 1, 2015 by Ryan in Burgers, Review and tagged blue duck, blue jawn, burger, duck fries, pork roll.